CAMBRIDGE – People often ask if regulators and legislators have fixed the flaws in the financial system that took the world to the brink of a second Great Depression. The short answer is no. Yes, the chances of an immediate repeat of the acute financial meltdown of 2008 are much reduced by the fact that most investors, regulators, consumers, and even politicians will remember their financial near-death experience for quite some time. As a result, it could take a while for recklessness to hit full throttle again. But, otherwise, little has fundamentally changed. Legislation and regulation produced in the wake of the crisis have mostly served as a patch to preserve the status quo. Politicians and regulators have neither the political courage nor the intellectual conviction needed to return to a much clearer and more straightforward system. In his recent speech to the annual, elite central-banking conference in Jackson Hole, Wyoming, the Bank of England’s Andy Haldane made a forceful plea for a return to simplicity in banking regulation. Haldane rightly complained that banking regulation has evolved from a small number of very specific guidelines to mind-numbingly complicated statistical algorithms for measuring risk and capital adequacy. Legislative complexity is growing exponentially in parallel. In the United States, the Glass-Steagall Act of 1933 was just 37 pages and helped to produce financial stability for the greater part of seven decades. The recent Dodd-Frank Wall Street Reform and Consumer Protection Act is 848 pages, and requires regulatory agencies to produce several hundred additional documents giving even more detailed rules. Combined, the legislation appears on track to run 30,000 pages. As Haldane notes, even the celebrated “Volcker rule,” intended to build a better wall between more mundane commercial banking and riskier proprietary bank trading, has been hugely watered down as it grinds through the legislative process. The former Federal Reserve chairman’s simple idea has been co-opted and diluted through hundreds of pages of legalese. The problem, at least, is simple: As finance has become more complicated, regulators have tried to keep up by adopting ever more complicated rules. It is an arms race that underfunded government agencies have no chance to win. Even back in the 1990’s, regulators would privately complain of the difficulty of retaining any staff capable of understanding the rapidly evolving derivatives market. Research assistants with one year of experience working on derivatives issues would get bid away by the private sector at salaries five times what the government could pay. Around the same time, in the mid-1990’s, academics began to publish papers suggesting that the only effective way to regulate modern banks was a form of self-regulation. Let banks design their own risk management systems, audit them to the limited extent possible, and then severely punish them if they produce a loss outside agreed parameters. Many economists argued that these clever models were flawed, because the punishment threat was not credible, particularly in the case of a systemic meltdown affecting a large part of the financial system. But the papers were published anyway, and the ideas were implemented. It is not necessary to recount the consequences. The clearest and most effective way to simplify regulation has been advanced in a series of important papers by Anat Admati of Stanford (with co-authors including Peter DeMarzo, Martin Hellwig, and Paul Pfleiderer). Their basic point is that financial firms should be forced to fund themselves in a more balanced fashion, and not to rely so heavily on debt finance. Admati and her colleagues recommend requirements that force financial firms to generate equity funding either through retained earnings or, in the case of publicly traded firms, through stock issuance. The status quo allows banks instead to leverage taxpayer assistance by holding razor-thin equity margins, relying on debt to a far greater extent than typical large non-financial firms do. Some large firms, such as Apple, hold virtually no debt at all. Greater reliance on equity would give banks a much larger cushion to absorb losses. The financial industry complains that efforts to force greater equity funding would curtail lending, but this is just nonsense in a general equilibrium setting. Nevertheless, governments have been very timid in advancing on this front, with the new Basel III rules taking only a baby step toward real change. Of course, it is not easy to legislate financial reform in a stagnant global economy, for fear of impeding credit and turning a sluggish recovery into a full-blown recession. And, surely, academics are also to blame for the inertia, with many of them still defending elegant but deeply flawed models of perfect markets that create an illusion of safety for a system that is in fact highly risk-prone. The fashionable idea of allowing banks to issue “contingent capital” (debt that becomes equity in a systemic crisis) is no more credible than the idea of committing to punish banks severely in the event of a crisis. A simpler and more transparent system would ultimately lead to more lending and greater stability, not less. 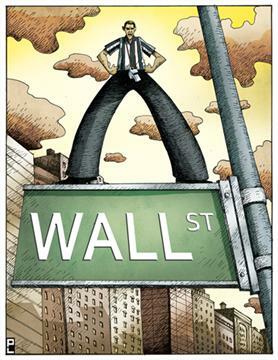 It is high time to restore sanity to financial-market regulation. Kenneth Rogoff, Professor of Economics and Public Policy at Harvard University and recipient of the 2011 Deutsche Bank Prize in Financial Economics, was the chief economist of the International Monetary Fund from 2001 to 2003. He is one of the world’s premier international economists, with influential publications spanning the fields of global finance, monetary and fiscal policy, and economic development. PARIS – The creation of Europe’s economic and monetary union is unique in the history of sovereign states. The eurozone constitutes a “society of states” of a completely new type, one that transcends the traditional Westphalian concept of sovereignty. 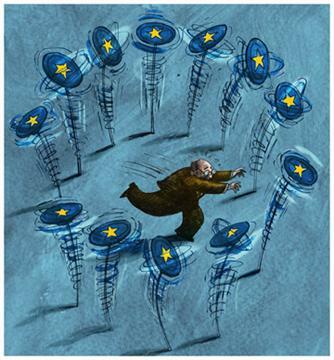 Like individuals in a society, eurozone countries are both independent and interdependent. They can affect each other both positively and negatively. Good governance requires that individual member states and the European Union’s institutions fulfill their responsibilities. Above all, economic and monetary union means just that: two unions, monetary and economic. Europe’s monetary union has worked remarkably well. Since the euro’s launch in 1999, price stability has been maintained for 17 countries and 332 million people, with average yearly inflation of just 2.03% – better than Germany’s record from 1955 to 1999. Moreover, the eurozone has created 14.5 million new jobs since 1999, compared to 8.5-9 million in the United States. This is not to say that Europe does not have a serious unemployment problem; but there is no obvious inferiority in Europe: all advanced economies must boost job creation. Likewise, on a consolidated basis, the eurozone’s current account is balanced, its debt/GDP ratio is well below that of Japan, and its annual public-finance deficit is well below that of the US, Japan, and the United Kingdom. The euro per se thus does not explain why the eurozone has become the sick man of the global economy. To understand that, one has to consider the weakness of Europe’s economic union. For starters, the Stability and Growth Pact, intended to ensure sound fiscal policies in the eurozone, was never correctly implemented. On the contrary, in 2003 and 2004, France, Italy, and Germany, sought to weaken it. The European Commission, the European Central Bank, and the small and medium-sized eurozone countries prevented the SGP from being dismantled, but its spirit was gravely compromised. A third source of weakness is that no crisis-management tools were envisaged at the euro’s launch. For much of the world at the time, “benign neglect” was the order of the day, particularly in the advanced economies. Finally, the high correlation between the creditworthiness of a particular country’s commercial banks and that of its government creates an additional source of vulnerability, which is particularly damaging in the eurozone. Fortunately, much progress has been made, including significant improvements to the SGP and the introduction of surveillance of competitiveness indicators and national imbalances. New crisis-management tools have been put in place. And there is a consensus that the EU’s stability and prosperity requires completion of the single market and obligatory structural reforms for all 27 members. A proposed banking union would help to separate the commercial banks’ creditworthiness from that of their government. The idea that sharing a single currency also means accepting limitations on fiscal sovereignty is not new. A “federation by exception” merely draws the logical consequences from the ineffectiveness of the fines envisaged by the SGP, and is fully consistent with the concept of subsidiarity that has been applied since the SGP’s introduction: as long as national economic policy complies with the framework, there are no sanctions. Perhaps the most important element of the “federation by exception” would be its strong democratic anchor. Its activation would be subject to a fully democratic decision-making process, with clear political accountability. More precisely, decisions to implement measures proposed by the Commission and already approved by the Council would require a majority vote by the European Parliament – that is, those representatives elected from the EU’s eurozone members. In such exceptional circumstances, the parliament of the country concerned should have the opportunity to explain to the European Parliament why it could not implement the recommendations proposed, while the European Parliament could explain why the eurozone’s stability and prosperity are at stake. But the final word would belong to the European Parliament. In the past, I have suggested establishing a eurozone finance ministry, which would be responsible for activating economic and fiscal federation when and where necessary, and for managing new crisis-management tools like the European Stability Mechanism. It would also be responsible for overseeing the banking union, and it would represent the eurozone in all international financial institutions and informal groupings. But, most important, “federation by exception” would ultimately cease to be an exception. The finance minister would be a member of the EU’s future executive branch, together with the other ministers responsible for other federal departments. From this perspective, the Commission presages a future European democratic government, as German Finance Minister Wolfgang Schäuble, who has proposed instituting an elected president, has suggested. The Council, meanwhile, appears to anticipate the European Parliament’s future upper house, with the lower house already elected by all EU citizens. I am fully aware of the boldness of what I propose. But Europeans must learn the lessons of the recent past. We must clarify the nature of what must be done to secure governance that is both democratic and as effective as circumstances require. Jean-Claude Trichet, a member of the Board of Directors of the Bank for International Settlements, was President of the European Central Bank (2003-2011) and President of the Bank of France (1993-2003). Would an orderly exit by Greece from the eurozone ever be possible? The question has become more pertinent for financial markets and investors this week, with a Financial Times/Harris opinion poll showing only a quarter of Germans believed the country should remain within Europe’s 14-year-old monetary union. Mario Draghi, European Central Bank president, will attempt on Thursday to take another step towards ensuring three-quarters of Germans do not get their way. The ECB governing council will discuss plans to eradicate – with eurozone politicians’ help – the “convertibility”, or eurozone break-up, risk priced into government bond markets. So far, Mr Draghi has refused to discuss any scenario other than the eurozone remaining intact. The eurozone, now comprising 17 countries, was constructed on the principle of irrevocability. Subject to official disapproval by European authorities, contingency planning by banks and investors has been largely hush-hush. Once the possibility of a country leaving is admitted, the danger was of speculation becoming self-fulfilling. The trouble is that we have moved beyond that point – talk about Greece exiting has become semi-open in Berlin. But Mr Draghi could use the ending of a taboo as an opportunity. If the scope for widespread economic and legal chaos as well as malfunctioning European capital markets were more widely understood, pressure on politicians to avoid such outcomes might mount. Few European lawyers are brave enough to argue an “orderly” exit from the eurozone is possible, and they are not just talking their own book. There is no legal basis under EU treaties for expulsion – unless a country also quits the EU, which would expose a country to even more economic damage. And a treaty change would require approval by 27 EU countries, including ratification by parliaments or referendums. A first step towards exit would be the imposition of capital controls – without notice, probably over a weekend or public holiday – to prevent money fleeing before a new currency was introduced. Immediately, the legal problems would begin. Athens could act unilaterally – and face the legal consequences later – or argue capital controls were essential to prevent a breakdown in public disorder. That would appear reasonable given that the likely collapse of the financial system, triggered by the withdrawal of ECB support for banks, would threaten riots on the streets. But any attempt, for instance, by Greek authorities to appropriate funds held by Greeks overseas would trigger a race to courts around the world; banks could be trapped between respecting Greek laws – or breaching obligations to customers. Further confusion would swiftly follow in determining what would be redenominated into the new currency (assuming, of course, that IT systems are able to cope with a change of currency). Until recently, lawyers devoted little thought to the definition of the euro. An established principle is lex monetae, whereby relevant laws are those of the country to which the currency belongs. Thus currency issues in a sterling contract would be subject to UK law. But the euro is not issued by a single country. Few bond or loan contracts define exactly what is a euro. One possibility would be to insist that the euro is the currency of Europe’s monetary union, but Greek companies have bigger legal issues on their plates right now. Eurozone investors might, anyway, be wary of defining the euro as the currency of the monetary union. What if Germany, rather than Greece, left the eurozone because it was fed up with the fiscal recklessness of its southern partners? German assets would then be denominated in the currency of a weaker rump euro bloc. Worrying about the legal definition of the euro would also deflect from the bigger picture. If Greece were to exit the eurozone fears of a wider break-up would almost certainly force Spain and Italy also to impose capital controls. Germany and other north European member states might want to impose restrictions to prevent destabilising inflows. In all probability, an eventual eurozone exit would follow only after time-consuming treaty change. Meanwhile, there would be a serious risk of financial market paralysis. The effects would quickly spread way beyond investors and banks with Greek interests. The impact on the European and global economy could be disastrous. Setting out plainly that horror scenario could strengthen Mr Draghi’s hand in his confrontations with eurozone politicians. PRINCETON – For the last century, economic-policy debate has been locked in orbit around the respective roles and virtues of the state and the market. Does the market control the state, in the sense that it sets a limit on governments’ ability to borrow? Or does the state take charge when the market fails to perform socially necessary functions – such as fighting wars or maintaining full employment? This old debate is at the core of today’s profound divisions over how Europe should respond to its debt crisis. The same question is dividing American politics in the lead-up to November’s presidential and congressional elections. During the two decades prior to the financial crisis, most people – including most politicians – assumed that the market was supreme. Now the intellectual pendulum may be swinging back to the belief that state action can mop up markets’ messes – just as veneration of the state in the 1930’s followed market worship in the 1920’s. Two decades ago, judicious European politicians looked for a “third way,” steering a zigzag course between the importance of market mechanisms and that of other social priorities, according to which the market needed to be directed. For example, when the Delors Committee prepared its report in 1988-1989 on how a monetary union could be established in Europe, experts devoted considerable attention to the issue of whether market pressure would suffice to discipline states. Many warned that it would not – that bond yields might converge at the outset, permitting spendthrift countries to borrow more cheaply than they otherwise could. Until the second half of 2008, Europe seemed to have reached fiscal Paradise: the market did not differentiate between eurozone governments’ bonds. Some assumed an implicit debt guarantee, but that was always implausible, given that the Treaty on the Functioning of the European Union explicitly ruled it out. Rather, investors’ undivided confidence in all eurozone borrowers reflected something else – a general belief in the capacity of rich countries’ governments. According to this view, advanced countries have a greater degree of fiscal sophistication. They are always able to raise tax rates in order to service their debt. In poor countries, by contrast, powerful vested interests often resist higher taxes on the wealthy, and widespread poverty makes it difficult to impose universal consumption taxes on the poor. That lesson was reinforced by the experience of countless debt crises in peripheral countries, the most destructive of which hit Latin America exactly 30 years ago, after ecstatic borrowing fueled economic booms. Sometimes these were simply consumption booms – whether for households or for military outlays and presidential palaces – and sometimes they were investment booms, though much of the investment had been misallocated as a result of political priorities. The novelty of the world since 2008 is that, for the first time in more than a generation, advanced countries are experiencing debt crises – and starting to look like poor countries with weak institutions. Was this just a peculiarity of the eurozone, in which sovereign countries did not control their own currencies? 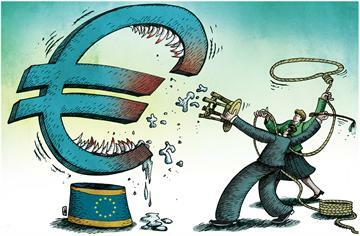 Europe’s debt crisis has produced a profound division of political – and also economic – opinion. Those who emphasize the historical uniqueness of Europe’s monetary solution insist that other countries – which control their own monies – could not possibly fall into such a predicament. Here the statist thesis is reflected in its boldest form: there cannot be a bond strike in the United States or the United Kingdom, because their central banks have at their disposal the full panoply of policy tools – including unconventional operations – needed to ensure that debt is monetized. That theory runs counter to much historical experience, as well as to the prevailing approach to central banking that emerged in the 1990’s. According to that view, investors punish profligate states by demanding higher interest rates to hedge against the likelihood of inflation; so the best way to ensure low borrowing costs is to give central banks as much independence from politicians as possible, and then make price stability their primary mandate. The European Central Bank is probably the most perfect expression of this philosophy. Its independence was secured not only by national legislation within the member states, but also by a treaty between them. Treaties are more binding than national legislation, because they are more difficult to revoke, amend, or repeal. Because the debts of the large industrial borrowers – the UK and the US – are externally financed, the argument that their governments can always monetize debt is not convincing. A moment may come when foreign investors do not believe that their sterling or dollar assets are protected against inflation, and at that point their willingness to hold low-yield sterling and dollar assets will end. The thinking behind the 1990’s approach to monetary policy is still fundamentally valid, but it requires institutional strengthening. It would be better to stop the twentieth-century ideological pendulum and return to some older precepts. Both states and markets work well only when adequately enforced legal rules provide the necessary certainty. Harold James is Professor of History and International Affairs at Princeton University and Professor of History at the European Institute in Florence. A specialist on German economic history and on globalization, he is the author of several noted books, including The Creation and Destruction of Value: The Globalization Cycle and Krupp: A History of the Legendary German Firm.